1. A honey bee is NOT a wasp, NOT a bumblebee, NOT a yellow jacket, NOT a ground bee, NOT a dirt dauber. A honey bee is APIS MELLIFERA. 2. There are three castes of honeybees in a hive. First, there are the Drones (males) whose only job is to fertilize the queen. When his duty is done, he dies. Drones have no stingers. Drones usually are thrown out of the hive (and die) in the fall. A drone may live up to 6 months. Second, there is the Queen. 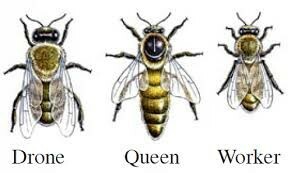 There is only one queen per hive, she is in control of the hive, she is the largest bee in the hive and her primary job is to mate and lay eggs (nearly 2000 per day). She has an un-barbed stinger and can use it over and over. The queen can live for 6 years but usually lasts only two years. Third, there are the Worker Bees. They have the barbed stinger that one feels when stung and die soon after stinging. If is to be done in the hive (feed the drones and/or the queen, forage for pollen and nectar, feed and nurse the young, clean the hive, make beeswax, keep the hive the correct temperature, guard the hive from intruders, remove waste and dead bees, make and clean the comb, bring water into the hive, etc.) the worker bee does it. Life expectancy of a worker bee in summer is 6 weeks. 3. It is estimated that 1100 honey bee stings are required to be fatal. There are nearly 50,000 bees in each hive and bees communicate with each other by dancing. 4. The average worker bee produces about 1/12th teaspoon of honey in her lifetime and a hive of bees will fly 90,000 miles, the equivalent of three orbits around the earth to collect 1 kg of honey. It takes one ounce of honey to fuel a bee’s flight around the world. A honey bee visits 50 to 100 flowers during a collection trip. 3. Honey bees are beneficial insects and if one comes upon a honey bee or their hive, leave it alone. 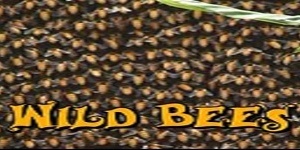 Bees are the only insect that produces food eaten by humans. Bees are attracted to dark colors and like strong sweet smells (perfume, powder, hand crème, suntan lotion, after shave) and get agitated by strong odors (especially perspiration). If a bees lands on you—remain calm and do not scream, she is only checking you out and will leave very shortly. If you must remove her, gently sweep her away with the back of your hand..
4. At least one-third (33.3%) of our daily diet comes from crops pollinated by honey bees. Without the pollen the honey bees transport, many plants can’t produce fruits, vegetables and seeds. The beef (cow) you eat needs the grasses in the fields to eat. Many flowers would not be able to set flowers or make seeds for next years blooms without bees. 5. Honey is the only food that includes all thee enzymes, water and minerals to sustain life and is the only food with pinocembrin, an antioxidant associated with improved brain functioning. Honey bees have 6 legs, 2 compound eyes made up of thousands of tiny lenses on the side of their heads, 3 simple eyes on the top of their head, 2 pairs of wings, a nectar pouch, stomach, abdomen and stinger. Honey bees have 170 odorant receptors, compared with only 62 in fruit flies and 79 in mosquitoes. Their exceptional olfactory abilities include kin recognition signals, social communication within the hive, and odor recognition for finding food. Their sense of smell is so precise that it can differentiate hundreds of different floral varieties and tell whether a flower carried pollen or nectar from 500 feet away. The honey bee’s wings stroke incredibly fast, about 200 beats per second, thus making their famous, distinctive buzz. A honey bee can fly for up to three miles, and as fast as 15 miles per hour. The bee’s brain is oval in shape and only about the size of a sesame seed, yet it has remarkable capacity to learn and remember things and is able to make complex calculations on distance traveled and foraging efficiency.